Trading on the Oslo Stock Exchange ended the year slightly down this week, but the exchange’s main index rose 5 percent for the year despite the recent dive in oil prices. Strong gains in shares outside the oil sector “saved” the index while heavy volume set a new trading record. In a report from the stock exchange (Oslo Børs) itself, officials cited share price gains for companies operating in Norway’s important seafood industry (second only to oil), along with companies in the information technology and consumer goods sectors. Major exporters like Borregaard and Norsk Hydro were among the stock market winners in Norway in 2014, aided not least by the decline in the value of the krone from record high levels. Stock exchange officials noted that shares traded in Oslo were “of course affected” by the “oil heavy” market in Norway, after oil prices were cut in half by the end of the year. 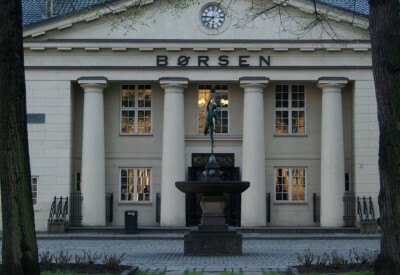 At the beginning of the year, shares in the energy sector made up 43.6 percent of the market value of the Oslo Børs. By Tuesday, when trading wound down for the year, they comprised 33.2 percent of the market value. Gains in other sectors like seafood, especially salmon, helped offset the decline, though, as did gains in shares in companies that benefit from the weaker krone. They included tourism-related companies like Royal Caribbean Cruises and Norwegian Air. Oslo Børs officials also reported that “never have so many shares been traded” on the Oslo Stock Exchange as in 2014, measured in terms of the number of transactions. An average of 95,600 shares changed hands every day and 19 new companies were listed on the Oslo exchange during the year. Trading measured in terms of krone value was also much higher than in previous years, with daily average trades ending at NOK 4.4 billion, up 28 percent from last year.